The Omega Trend Indicator is an advanced tool that has been specifically designed to detect market trends early, and follow them efficiently. The indicator draws two lines. The main (thicker) Trend Line represents the presumed lower or upper volatility limits of the current market trend. A break in the main Trend Line indicates a potential reversal or shift in the movement of the trend. The Trend Line also indicates the best point to place a stop loss order. In Omega Trend Indicator, the Trend Line indicates the exact point of the initial stop loss, as well as where the trailing stop is moving. For uptrends the Trend Line is blue, for downtrends it is pink (see the first image below). The secondary (thinner) Pivot Line represents the presumed Pivot level of the market. Breaks in this line can be used for short-term/scalping trades following the current market trend indicated by the Trend Line. Although the Omega Trend Indicator’s signals are clear and easy to interpret (see the second image below), there are a few steps you should follow to filter out false trading signals. First, you need to be able to recognize a choppy market and try to ignore it. A choppy market is a market that is highly volatile but results in no overall price movement, in either direction. These price spikes and sharp rebounds from the range borders can generate a series of poor signals. In the third image below, you can see an example of a choppy market. A choppy market presents the worst possible conditions for any breakout or impulse trading strategy. If you use the Omega Trend Indicator under these conditions, do not be surprised if you have poor results. Omega Trend Indicator signals are at their most reliable, when following the market in trend or swing mode. Avoid trading in periods of low liquidity. In these periods, the market is generally in a narrow range. Periods of low liquidity normally occur after the close of the NY trading session and often throughout the entire Asian session. The best signals from the indicator could be expected during the London and the NY trading sessions (8-21 GMT). I recommend Omega Trend Indicator for the EURUSD, EURJPY, USDCHF, GBPJPY and GBPUSD pairs. As well all market instruments with a trending behavior are appropriate. You can use it on all timeframes, for scalping, day trading or long-term investing. I strongly recommend that you adapt visually the indicator lines to the chart. The default settings are not suitable for all chart periods and all market instruments. The most important settings you should try to adapt are: Volatility_Period, TrendLine_Level, PivotLine_Level and Bar_Acceleration. The default settings are not suitable for all timeframes and all market instruments. The most important settings you should try to adapt are: Volatility_Period, TrendLine_Level, PivotLine_Level and Bar_Acceleration. Show_Arrows - show/hide the signal arrows on the chart. Show_Histogram - show/hide the indicator histogram. 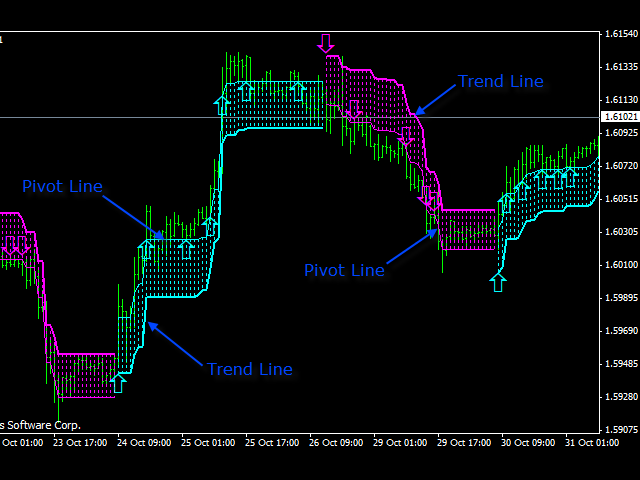 Show_PivotLine - show/hide the pivot line. Alerts - activate/deactivate the signal alerts. Volatility_Period - the indicator period of the volatility calculation. Smooth_Factor - the smoothing factor of Omega Trend Indicator lines. The default value of the Smooth_Factor is zero, which means that smoothing is not used. Max_Width_Pips - the maximum distance allowed between the Trend Line and the market price in standard 4 digit pips. This parameter limits the initial stop loss and the trailing stop values. Min_Follow_Pips - the minimum distance allowed between the Trend Line and the market price in standard 4 digit pips. This parameter defines the minimal value allowed for the trailing stop. For more info and complete list of settings, visit the blog! 5 stars from my side! Definitely a good trend indicator. I've noticed that only one person gave 2 stars review and don't understand why. Another good thing is that the author responds really fast and is considering users advices (for example adding email alerts in the future, which in my opinion is useful to have). Great indicator! I ran it in visual backtest mode to learn how to use it and it works great at giving good signals. Author is very experienced with the markets! Good job! it works as described and expected. You will get profit when using with analysis. 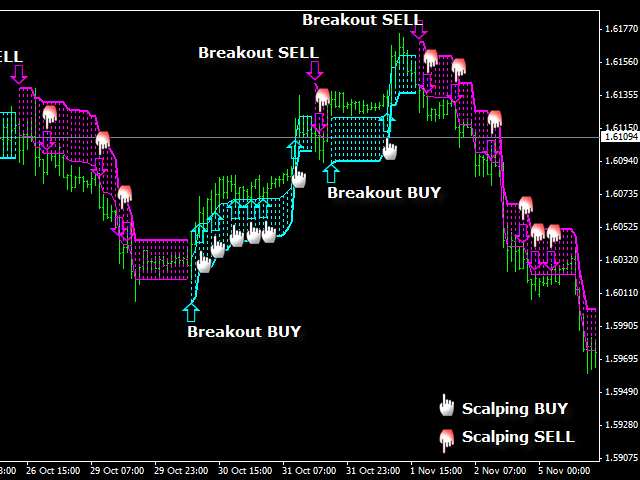 I am scalptrader and my greatest problem is, find exits at right time. Sometimes it works well sometimes it doesnt. This indicator helps me, to take measures, when price is running against me, and keep losses small, and profits bigger. It seems to be very promising. Providing such an indicator for free, only a successfull trader can do. Many green pips to you and of course the other traders. Very good and easy to use indicator! Thank you for sharing it. Added the Send_Push_Notifications parameter. When enabled, the Omega Trend Indicator will send Push Notifications to mobile devices of the users. By default, the new parameter is disabled. You have to set it TRUE in order to use the new functionality.